I first heard of Swedish band Electric Boys via their 1989 single “All Lips and Hips”, which reached #16 on the US Mainstream Rock charts in 1990. I dug that. But at that time, there was a glut of similar metal bands all vying for attention, and the Boys just kind of faded into the background. They released a pair of albums to some European success in 1992 and 1994, then split. Reforming in 2011, Electric Boys released the excellent And Them Boys Done Swang. Some of those tracks still reside on compilation mixes I use today. Their 2014 effort Starflight United failed to hold my attention, but I received The Ghost Ward Diaries with interest. The album is a strong mix of funk and metal… in some places a mashup of Living Colour, Raging Slab and Spin Doctors (in a good way). Opening track “Hangover In Hannover” pulls no punches as a solid rocker to kick off the album. While the verses follow a somewhat predictable aggressive path, the bridge/chorus are very much what I can recognize as Electric Boys. Certainly, “There She Goes Again” varies in both tempo and rhythm. It’s different, but it all seems to work, and is pretty catchy. “You Spark My Heart” sounds like a very current attempt to land a score on pop/rock radio. It simply floats along with no real lasting appeal or sounds that set it apart from other mainstream rock songs. There is a crunchy element to the opening guitars on “Love Is A Funny Feeling.” As per Electric Boys, there are lots of horns and funky keyboards throughout the rest of track four. At this point, this is a fun album to listen to. Damn, it’s not so much hard rock as a funk-o-metal good time. Of course, I then smack into the requisite mid-tempo album filler, “Gone Gone Gone.” Despite Electric Boys’ unique sound and style, this track is pretty generic, but at least it’s not a ballad to totally kill the mood. Impressively, the very next song is a high octane instrumental, “Swampmotofrog.” What a great listen for some different sounds, from balls out power to a bit of funk and ’70s style arena rock. It is as unusual and undefinable as the title itself. The slide guitar peppered across “Swampmotofrog” foreshadows some upcoming tracks. Before that happens, “First The Money, Then The Honey” is a straightforward rock song very much in the style of Electric Boys but generally unremarkable. Back to swamp blues, “Rich Man Poor Man” works with a southern rock guitar line and a sneer in Connie Bloom‘s vocals. There’s one bit featuring a backing mandolin early on that changes the feeling for a moment, but the song itself is a decent stomp with slide guitar. This theme follows through with “Knocked Out By Tyson” as another blues inspired rock tune. The bridge is a bit weak, but it also serves to highlight the decent parts in the rest of the song. As I mentioned, I loved the band’s 2011 release as my most recent connection to Electric Boys. 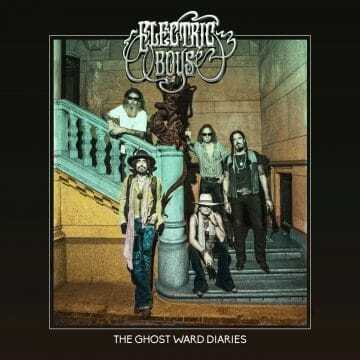 I think The Ghost Ward Diaries is a pretty good album, although not quite as strong as Them Boys Done Swang, in terms of memorable singles. The Ghost Ward Diaries will likely appeal more to the band’s current fan base, rather than win over new converts.